Frédéric Chopin (1 March 1810 – 17 October 1849) was a Polish pianist and composer of classical music who lived in Paris from age 21. He wrote almost solely for piano and remains the most widely played composer for that instrument. He also wrote for violin and viola. His music ranged from patriotic, melancholy, passionate to simple and beautiful, and he was known as a great teacher of piano. Messieurs, I should like to be granted the favour of performing at one of your admirable concerts, and this I beg to ask of you. Trusting, since I lack other qualifications to obtain this, in your goodwill towards artists, I dare to hope that you will greet my request favourably, I have the honour to be, Messieurs, your very humble servant. My piano has not yet arrived. How did you send it? By Marseilles or by Perpignan? I dream music but I cannot make any because here there are not any pianos . . . in this respect this is a savage country. Quoted in Arthur Hedley, Chopin (1947). I wish I could throw off the thoughts which poison my happiness, but I take a kind of pleasure in indulging them. Variant translation: I wish I could throw off the thoughts which poison my happiness. And yet I take a kind of pleasure in indulging them. As quoted in Chopin : Pianist and Teacher as Seen by His Pupils. Time is still the best critic, and patience the best teacher. As quoted in Chopin and the Swedish Nightingale. As quoted in If Not God, Then What? Stuttgart. After 8th September 1831. Here you doubtless observe my tendency to do wrong against my will. As something has involuntarily crept into my head through my eyes, I love to indulge it, even though it may be all wrong. As quoted in Chopin's Letter. I have met Rossini, Cherubini, Baillot, etc.—also Kalkbrenner. You would not believe how curious I was about Herz, Liszt, Hiller, etc. — They are all zero beside Kalkbrenner. I confess that I have played like Herz, but would wish to play like Kalkbrenner. If Paganini is perfection, Kalkbrenner is his equal, but in quite another style. His letter to Tytus Woyciechowski in Poturzyn. Paris, 12 December 1831. Play Mozart in memory of me— and I will hear you. Murmured by Chopin on his death-bed. Concerts are never real music, you have to give up the idea of hearing in them all the most beautiful things of art. Chopin‘s pianistic production is overall more voluminous and somewhat more consistent in emotional substance, however wonderful much of Schumann‘s work is. Chopin did not need to append words to music to make it songful; in fact it seems to me that he does better without them! Incidentally, their lack of popularity must largely be due to their being set to Polish words, and as far as I know, translating them would lessen their effect. Chopin wrote many small pieces – mazurkas, waltzes, préludes, nocturnes – many more than Schumann. That covers the needs of millions of amateurs who love music, but do not command the instrument well enough and who love Chopin’s music. It enters their hearts. Chopin is played much more than Schumann in China, both in concert halls and music schools. The reason, if I put it in a most simple and direct way, Chopin is more universal, appeals more to the masses. Schumann is more personal, appeals more to the elites. Being Chopin a pianist himself, his works are mainly conceived for the piano. When people use the word “pianistic“, it means that the pieces lay easily, naturally and smoothly under the fingers. This is true for Liszt and Debussy too. Music was his language, the divine tongue through which he expressed a whole realm of sentiments that only the select few can appreciate... The muse of his homeland dictates his songs, and the anguished cries of Poland lend to his art a mysterious, indefinable poetry which, for all those who have truly experienced it, cannot be compared to anything else... The piano alone was not sufficient to reveal all that lies within him. In short he is a most remarkable individual who commands our highest degree of devotion. Franz Liszt, "Revue et Gazette Musicale de Paris", May 2, 1841, pp. 245f. According to a tradition—and, be it said, an erroneous one—Chopin’s playing was like that of one dreaming rather than awake—scarcely audible in its coninual pianissiomos and una cordoas, with feebly developed technique and quite lacking in confidence, or at least indistinct, and distorted out of all rhythmic form by an incessant tempo rubato! The effect of these notions could not be otherwise than very prejudicial to the interpretation of his works, even by the most able artists—in their very striving after truthfulness; besides, they are easily accounted for. In keeping time Chopin was inflexible, and many will be surprised to learn that the metronome never left his piano. Even in his oft-decried tempo rubato one hand—that having the accompaniment—always played on in strict time, while the other, singing the melody, either hesitating as if undecided, or, with increased animation, anticipating with a kind of impatient vehemence as if in passionate utterances, maintained the freedom of musical expression from the fetters of strict regularity. His creation was spontaneous, miraculous. He found it without searching for it, without foreseeing it. It came to his piano suddenly, complete, sublime, or it sang in his head during a walk, and he would hasten to hear it again by, tossing it off on his instrument. But then would begin the most heartbreaking labor I have ever witnessed. It was a series of efforts, indecision, and impatience to recapture certain details of the theme he had heard: what had come to him all of a piece, he now over-analyzed in his desire to write it down, and his regret at not finding it again "neat," as he said, would throw him into a kind of despair. He would shut himself up in his room for days at a time, weeping, pacing, breaking his pens, repeating and changing a single measure a hundred times, writing it and effacing it with equal frequency, and beginning again the next day with a meticulous and desperate perseverance. He would spend six weeks on one page, only to end up writing it just as he had traced it in his first outpouring. There is no weak piece by Chopin. Still, his music is played so poorly so often, and that does not do him any good. The Sonata in B flat minor and the ballad in G minor are played much very often. It does not mean I wouldn’t play them, but I wouldn’t do it so much. It was Chopin who properly set romantic pianism on its rails and gave it the impetus that shows no signs of deceleration. He did this all by himself, evolving from nowhere the most beautiful and original piano style of the century. 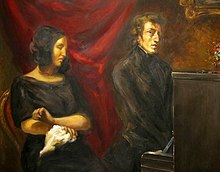 Chopin was a romantic who hated romanticism. This is the paradox. It was Chopin who, of all the early romantics, has turned out the most popular. Virtually everything he composed has remained in the repertoire, and a piano recital without some Chopin on it is still the exception. […] In his day he was a revolutionary. To many his music was exotic, inexplicable, perhaps insane. Critics like Rellstab in Germany, Chorley and Davison in England, dismissed much of Chopin’s music as eccentricities full of earsplitting dissonance. Fortunately the picture as it stands is quite complete, and the figure of Chopin clearly emerges: that marvelously controlled, original, poetic, nuanced classic-romantic pianist and musician, whose physical resources may have been small but whose spirit and conception were epical. Hats off, gentlemen — a genius! If the mighty autocrat of the north knew what a dangerous enemy threatened him in Chopin's works in the simple tunes of his mazurkas, he would forbid this music. Chopin's works are canons buried in flowers. After playing Chopin, I feel as if I had been weeping over sins that I had never committed, and mourning over tragedies that were not my own. Chopin was the first piano composer who knew exactly how to make piano sound reach fullness, radiance and grandness. What to regard and what, by all means, to avoid. Chopin was keenly aware of the overtones and he did take care of them so artfully. Chopin has done for the piano what Schubert has done for the voice. 'The France musicale' review of Chopin's concert held on 26 April 1841. As quoted in Nocturne: a life of Chopin. ↑ Chopin's Letters, by Frederic Chopin and E. L. Voynich Feb. 1, 1988 p 89. ↑ Oeuvres autobiographiques, ed. Georges Lubin, 2 vols. (Paris, 1978); Vol. 2: Histoire de ma vie, p. 446. I (Jeffrey Kallberg) have modified somewhat the English translation printed in George Sand, Story of My Life: The Autobiography of George Sand, group translation ed. Thelma Jurgrau (Albany, 1991), p. 1109. Note: The chapter on Chopin dates from August or September 1854. ↑ Nocturne: a life of Chopin (Jordan, 1978), p. 186. This page was last edited on 24 January 2019, at 23:29.